Big games always come down to big plays. The teams that make the most big plays usually win. That was certainly the case on Friday night at Sheldon High School. There, during the West Linn football team's 38-26 loss to the Irish, Sheldon scored on its first six possessions, turned the ball over just once and racked up a commanding 38-13 halftime lead. The Lions, on the other hand, scored on just two of their first eight possessions, committed four turnovers and couldn't recover despite posting a 13-0 edge in the game's final two quarters. So let's take a look back at all the game's biggest plays and the outcomes they produced. • On Sheldon's third offensive play, Irish quarterback Michael Johnson Jr. hit Zach Folsom for a 61-yard touchdown 31 seconds into the game. • On West Linn's first offensive play, Dawson Jolley ran 66 yards up the middle to set up his own 2-yard TD five plays later, cutting Sheldon's lead to 7-6 in the process. • On Sheldon's second possession, Matthew Burgess capped a 66-yard drive when he ran right, cut back and turned it into a 24-yard score for a 14-6 lead with 5:22 left in the first quarter. • On West Linn's next offensive play, Lions quarterback Ethan Long fumbled the snap out of the shotgun formation and Sheldon's Austin Lasby recovered at the West Linn 28. • Burgess came through next, ending Sheldon's six-play drive with a 16-yard TD run around left end that gave the Irish a 21-6 lead with 2:22 left in the opening quarter. • After West Linn turned the ball over on downs at midfield, Burgess scored again for Sheldon, this time blasting into the end zone from 5 yards out to extend his team's lead to 28-6 with 6:01 to go in the half. • Two plays later, Long tried to throw a screen pass into the right flat, but it was picked off near midfield by defensive end Jack Olive and he returned it to the West Linn 14-yard line. • Sheldon took advantage again, tacking on a 25-yard Jay Kartub field goal to make it 31-6 with 2:42 remaining in the half. • On West Linn's next play, Long hit Cade Knutson over the middle, he broke a tackle and turned it into a 78-yard gain. Four plays later, Casey Tawa took an end around to the right side, pulled up and threw a 4-yard TD pass to Jake Mastrandrea that cut the Irish lead to 31-13 with 1:33 to go before the break. • On their ensuing possession, the Irish drove 59 yards in just 1:17, getting a 34-yard Johnson pass to Folsom, and later, a 3-yard Johnson TD run to make it 38-13 with 11 seconds left in the half. • On the opening kickoff of the second half, West Linn's Tanner Moore fumbled the ball away to the Irish at the Lions' 24-yard line. • The Lions then forced Sheldon into its first turnover, with Brodie Carrington picking off a Johnson pass in the end zone to prevent another Irish score. • The Lions' next possession — they picked up 62 yards and ran 3:30 off the clock — ended when Sheldon stopped West Linn at the Irish 19-yard line. • After a West Linn stop, Jolley capped his team's 87-yard drive when he took a handoff up the middle, sped 30 yards to score and cut Sheldon's lead to 38-20 with 2:08 to go in the third quarter. 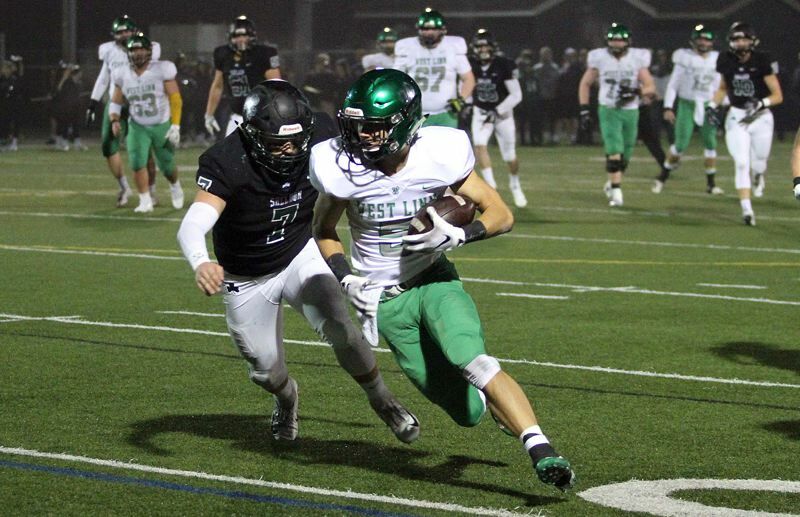 • After another West Linn stop, the Lions' ensuing possession was scuttled when Parker Wiles picked off Long's pass at the Irish 2-yard line and prevented West Linn from further cutting into the Sheldon lead. • Long hit four straight passes for 40 yards to set up Jolley's last score, a 3-yard run with 3:52 remaining in the contest, but the Irish ran out the clock from there.